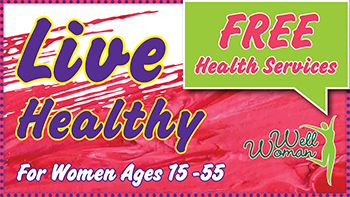 Well Woman (WW) creates the opportunity for women to receive recommended preventative services, screenings, and management of chronic diseases such as elevated cholesterol, and hypertension. WW seeks to optimize the health of women before, during, between, and beyond potential pregnancies. The goal of the Well Woman program is to provide preconception and interconception care to women ages 15-55 as a foundation for wellness through health counseling/coaching, health promotion, chronic disease identification, and planning/adopting a healthy lifestyle. For more information on Well Woman Alabama, contact Sabrina Doby-Horn by calling (334) 206-5672 or emailing sabrina.doby-horn@adph.state.al.us. Also visit Well Woman Alabama on Facebook.